Saint John's, a school that's certainly be considered one of teams to beat at next weekend's All State Finals, made quick work of it competition Saturday at the Central Massachusetts Division 1 State Championships. The Poineers bunched all seven of their varsity runners in the top 10 positions and cruised to an easy 18-84 decision over runner-up Wachusett Regional. 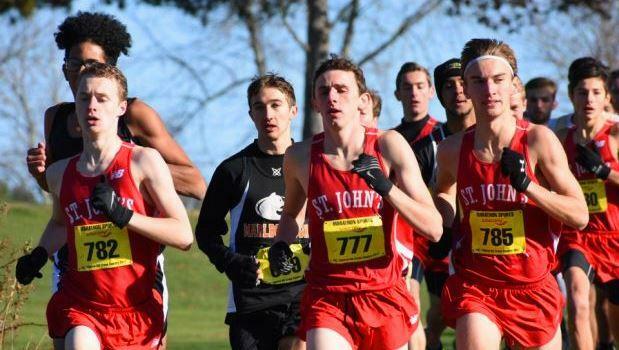 Saint's John's wrapped it up from the beginning with a 1-2-3 finish, led by individual titlist Joshua Rahn. Rahn finished with a time of 16 minutes, 29 seconds for the challenging 5K terrain at the Gardner Municipal Golf Course. He edged fellow classmate Patrick Craemer, who was timed in 16:30. The Pioneers Dominic Mastromatteo took third at 16:38. Thomas Goodhue (fifth, 17:08) and Tyler Griffin (seventh, 17:15) completed the scoring. Shrewsbury's Andrew Kaye (fourth, 16:59) and Marborough's Brian Oram (sixth, 17:10) broke up the Pioneers' party. Shepherd Hill was impressive in capturing the girls' Division 1 crown with a 31-59 win over second-place Groton Dunstable. The Rams' Rebekah James and Gabrielle Lawrence set the tone by taking the top two positions. James broke the tape in 19:19. Lawrence finished in 19:51. Agonquin Regional's Tess Reyes (19:56) and Wachusett's Jamie Falla (19:56) also broke 20 minutes by taking the third and fourth spots, respectively. Groton' freshman Sydney Adams was fifth in 20-minutes flat. Competing the scoring for Shepherd Hill was Emma Sullivan (ninth, 20:32), Emma Whitehead (tenth, 20:32) and ninth-grader Helena Duke (12th, 20:52). In a tight battle for team honors, Hopedale squeaked by Parker Charter, 62-65, to bring home the Division 2 boys' plaque. The Blue Raiders had their five scoring runners among the first 19 placements to secure the close decision. Brandon Hall (third, 17:02) and Colin Black (tenth, 17:28) cracked the top 10. Ayer-Shirley's Ethan Matthews won the race with a solid 16:33 clocking. Parker Charter's Nico Agosta was second at 16:46. Rounding out the top five was Parker Charter's Quinn Cantrill (fourth, 17:07) and Blackstone Valley's Zach Bergeron (fifth, 17:08). Highlighted by a 1-2 finish by twin sisters Sarah Roffman and Kaitlyn Roffman, Littleton won the girls' Division 2 title, defeating Parker Charter, 59-101. The Tigers averaged a time of 20:41 by their five scoring runners, 59 seconds faster than the Panthers. Sarah Roffman manufactured the quickest time for girls with an 18:57 winning effort. Kaitlyn Roffman took second in 19:30. Holy Name's Sophia Masciarell (third, 20:01), Tyngsborough's Sophie Campbell (fourth, 20:22) and Advanced Math and Science Academy's Megan Scott (fifth, 20:39) secured the next three spots.